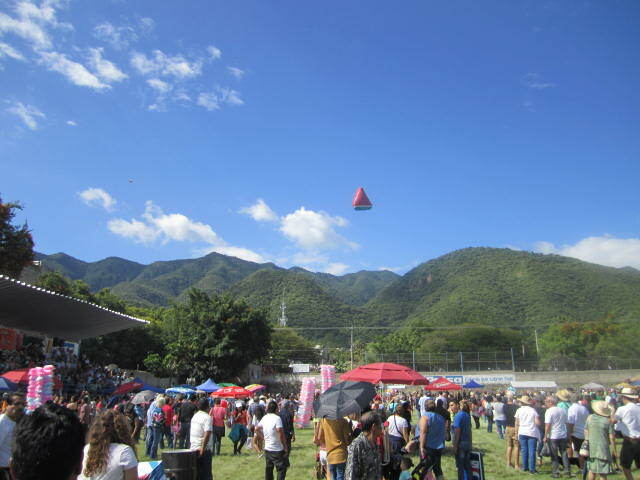 After a few months of the rainy season, the Globos Festival kicks off many holidays and hopefully, less rain. Bring on the sunshine! I am ready. And this was one of the prettiest days of the Globos I have ever experienced. There were no signs of rain. Just fluffy white clouds. It was perfect for sending up the fantastic paper mache creations. 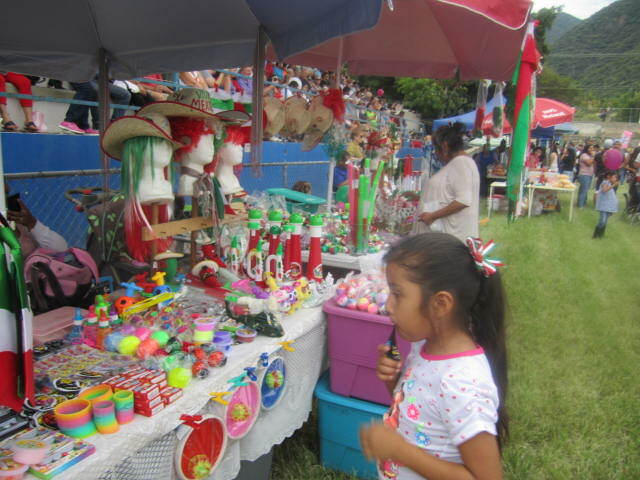 The first two photos are of the ones belonging to Accesslakechapala.com. For sure, I would put these on at the beginning because they are so important to us. 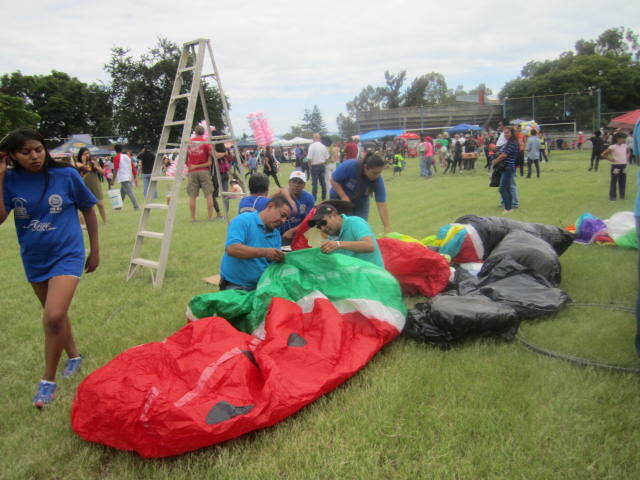 This Globo was one of the biggest, thus the hardest to get up. But as you can see in this next photo, it was successful. I liked the white color because it looked like a round white cloud. 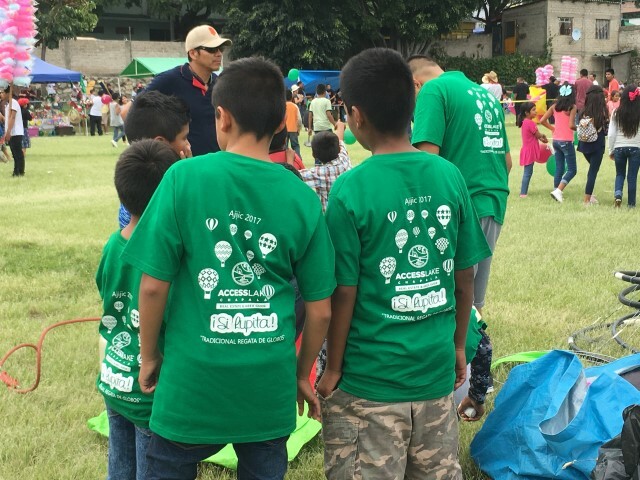 Each team that sends up a Globo, wears the same color and wording on their t shirts. That makes it easier for people to know who to ask for help and who to blame when things go wrong. Although I doubt if there is much infighting. It is all in good fun. If they go up or burn up , it is still fun. 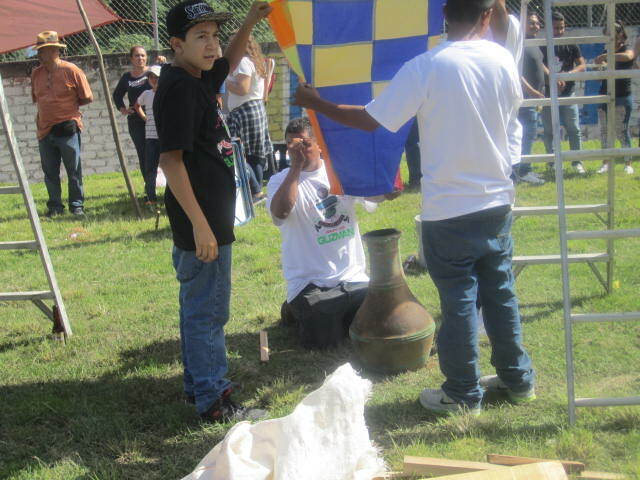 It looks like some of the boys helping out with the Accesslakechapala Globo are very young. Technicians in training. They did a good job. Getting the larger ones up is difficult. Above is a photo of the entrance. There is never a charge but they have a couple of boxes with slots in the top in case you feel like donating to help with next year’s event. I wanted to show an overview of the crowds in the field. 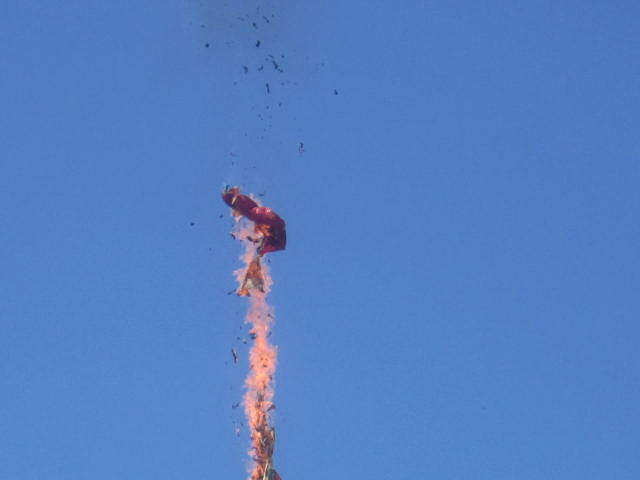 No one seems bothered by the fact that sometimes the Globos crash and burn. When that happens, instead of running away, lots of people run toward the fire. Especially the little boys. They love all that action. This little girl can’t decide which toy she likes best. So many of them to choose from and they are all bright colors. 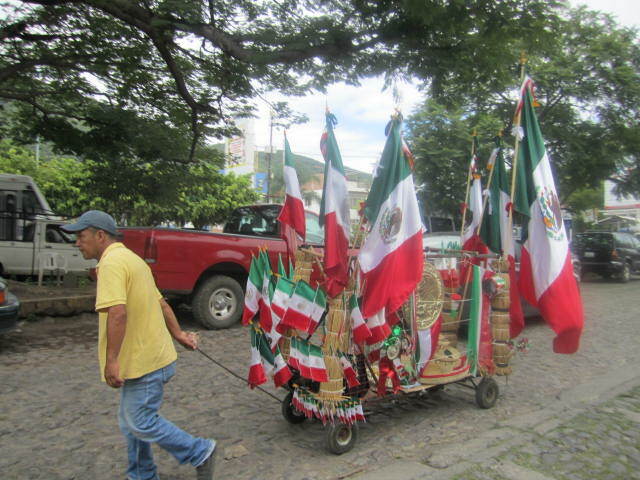 There are some small Mexican flags at the very left of the photo. I should have bought one of those for my house. But I was too busy taking pictures to do any shopping. 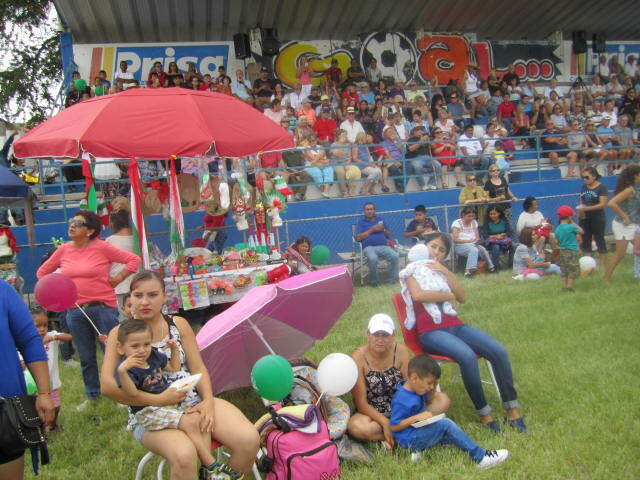 Most of the crowd preferred to sit or stand in the field instead on being confined to the Bleachers. I like to be in the field and see the action up close. 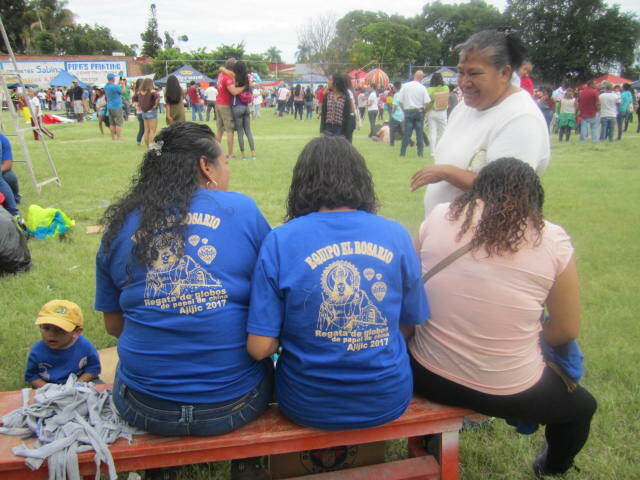 These young women seem to be getting instructions from the woman standing beside them. I love the little boy wearing the same kind of t shirt and a yellow hat. I bet he felt important as a part of a team. 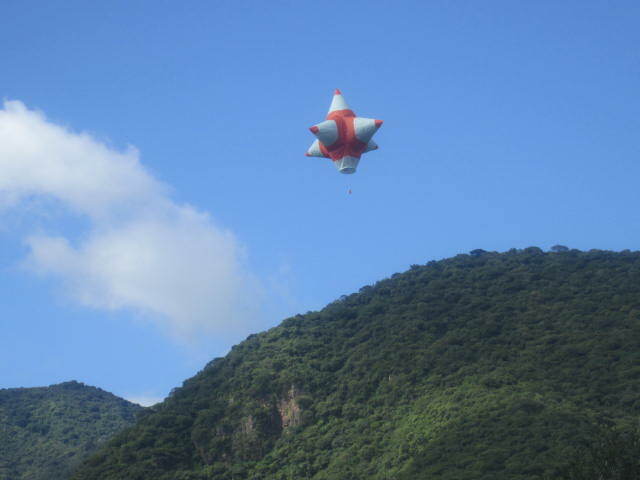 Above is a photo of one of the larger Globos. It takes a lot of time to get them ready to be filled with hot air and they easily tear before that happens. Above is what sometimes happens. 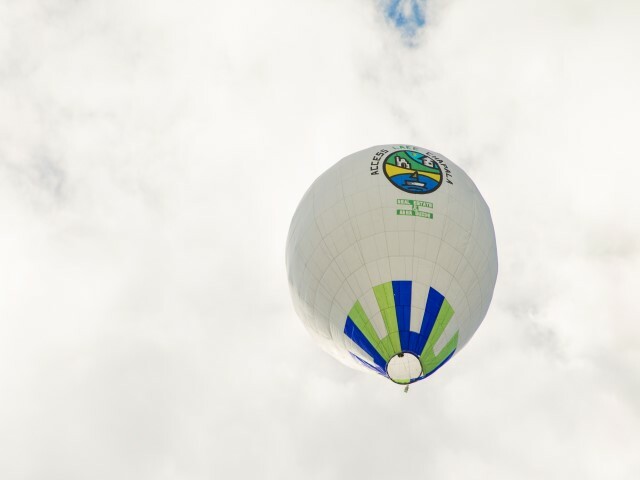 A Globo will go into the stands instead of the sky. No one seems particularly worried. They are standing under it and one man is even taking photos of it burning right over his head. Where is the fire marshal? Maybe there isn’t one in Mexico. Or fire codes. Everything just runs on faith. If it is meant to be or not. It is all up to God’s will. God is their insurance company. 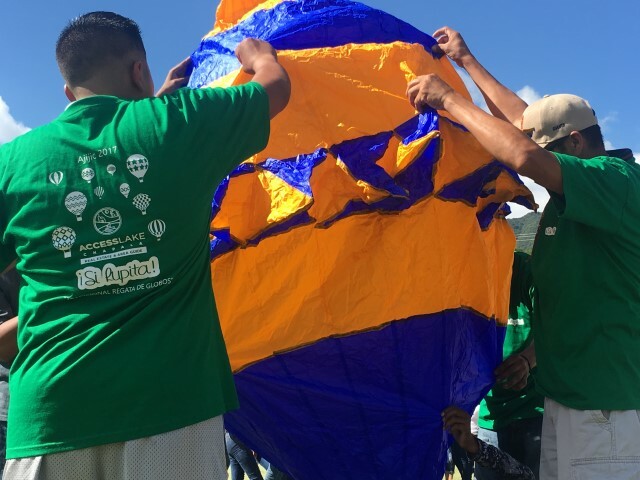 It takes a group of people to get one Globo launched. Always involving a ladder and one brave soul to stand on the top of it to hold the Globo up. If you are interested in learning more about how they are made or seeing other photos from previous years, check out the other articles I have written about the event on this site. The above Globo managed to go a long ways. Sometimes if they can get off the ground, they can go for miles. Maybe finally falling down in a corn field somewhere and burning up a crop. I heard about that happening years ago and the owner of the Globo had to pay for that crop. But all in good fun. Right? Above was one of the larger Globos. It didn’t make it far until it caught fire and crashed. 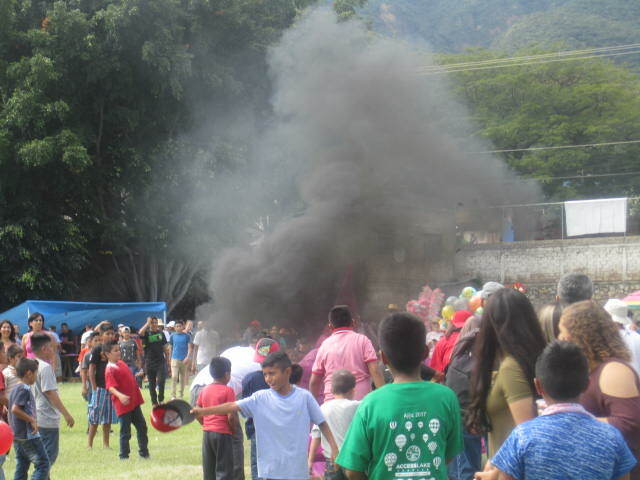 As I wrote earlier in this article, the globos that crash and burn are a big hit with the viewers. Look closely at the people in that photo, mostly young boys. I like the boy holding out his hat to keep people away from the fire. Maybe he will be a fireman when he grows up. The above burning Globo was quite dramatic. Yet people still stood right under where it was falling in flames. 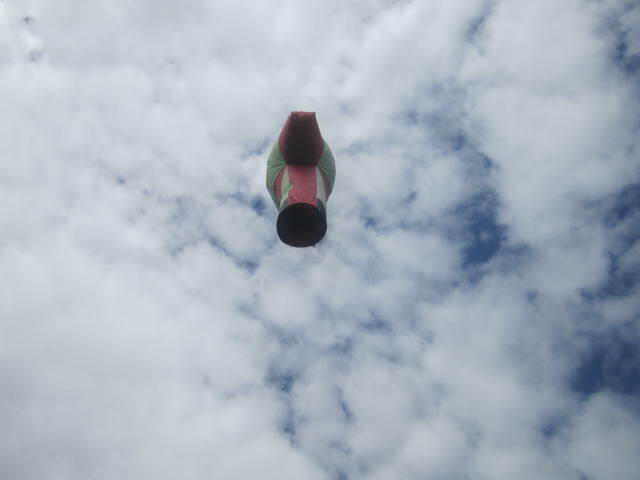 The Globo above made it and floated a long ways from the field. Success! 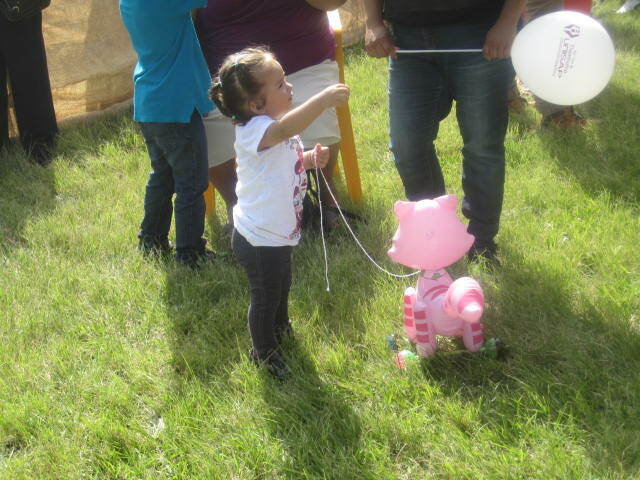 I liked the little girl with the pink kitty. 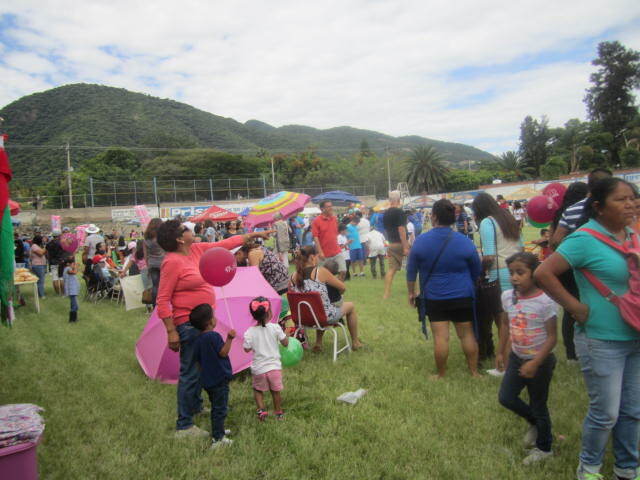 Children seem to love this event. 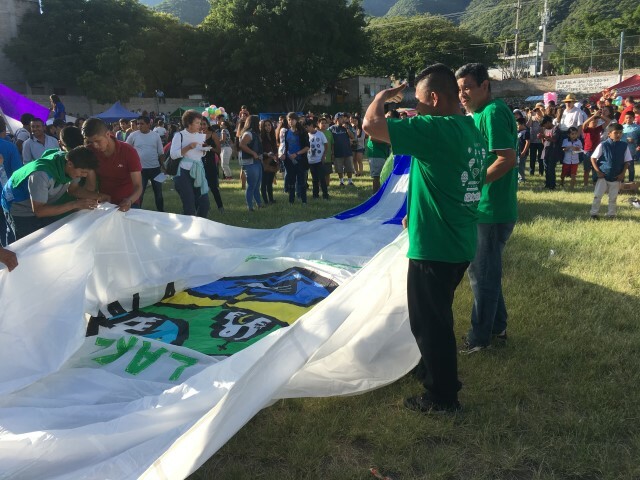 Above is a photo of the men holding the globo over the fire to fill it up. This is a crucial part of the process and mostly when things get out of control and they burn up instead of floating into the sky. 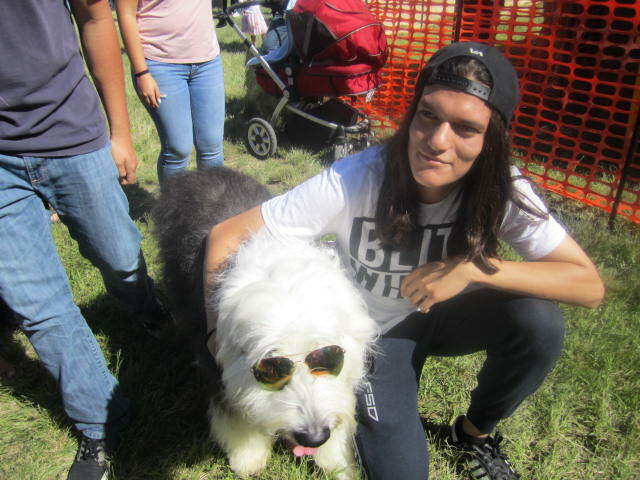 I remember this same dog at the Globos last year. Lots of people wanted to have their picture taken with him. Or maybe it was a her. Hard to tell with all that fur. But I think he/she enjoys the attention. The sunglasses were a big hit. I liked the above photo because it shows the green mountains. 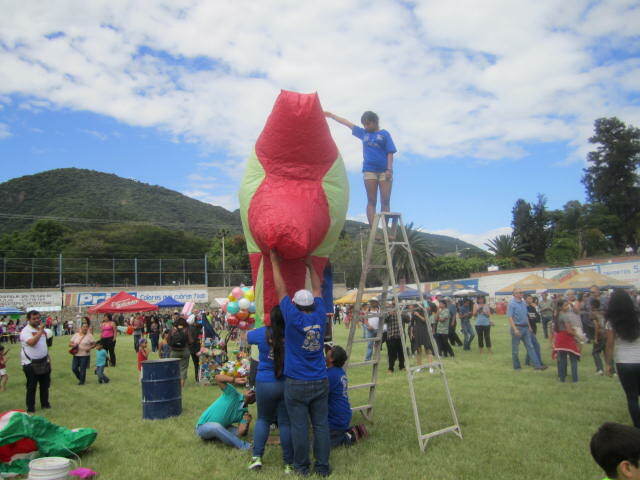 This was one of the first globos to go up. The smaller ones went up at the beginning. Notice the umbrellas. Not for rain but for protection from the sun. 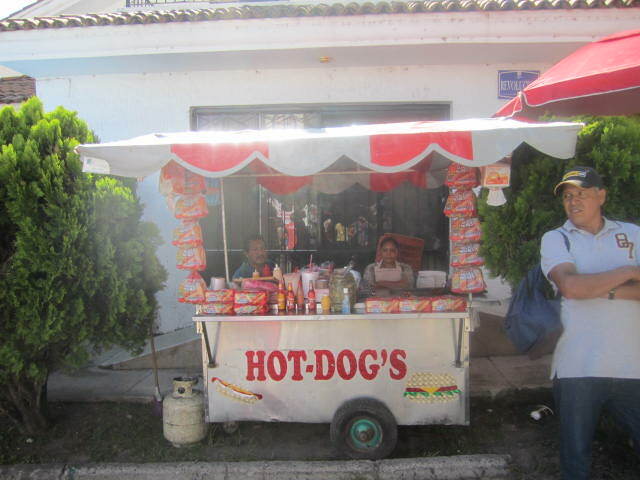 Above is one of the food stands. Hot dogs curled around sticks are very popular here. 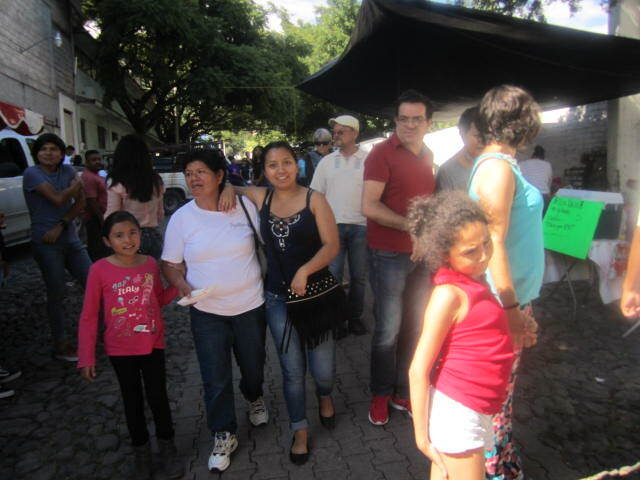 The photo above is just a part of the crowd that was coming down to see the Globos. Revolution street was filled on both sides with various food stands. 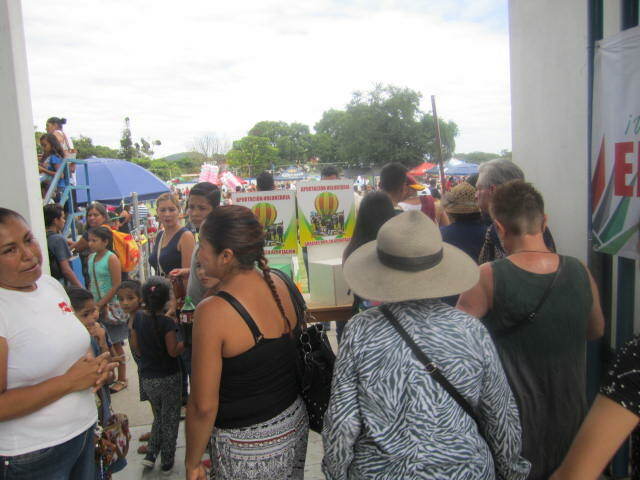 And also inside the gate, on the field, there were many food and beverage stands. 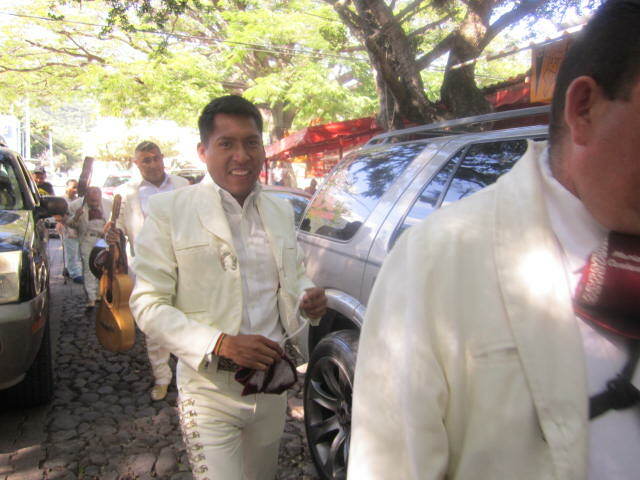 I wanted to publish two photos of the mariachi group. Their costumes are so beautiful. And they are also handsome men. It was almost enough to make me walk back down through the crowd to listen to them play. But check out the crowd in the photo above them. I enjoy being in crowds but only for a limited amount of time. 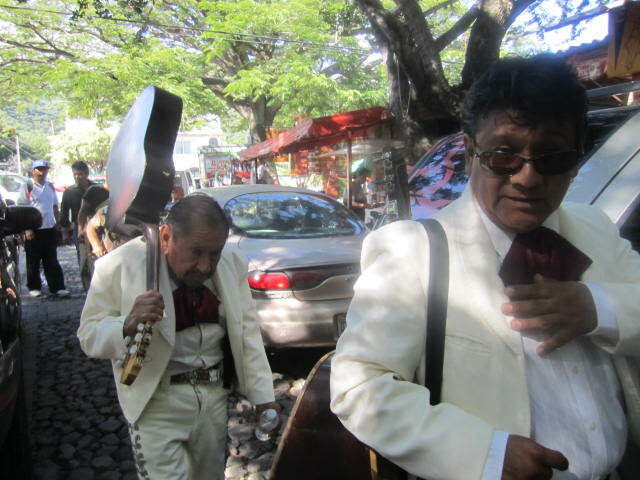 I love this photo of the elderly mariachi musician, still going strong. I was having a hard time just walking back up the hill in the heat and crowds and there he was, coming down the hill, carrying his guitar to play another gig. And I also like the look of pride in the face of the man in front of him. They made me wish I had stayed longer but I was too hot and tired. I can’t say enough about how fun it is at the globos celebration. 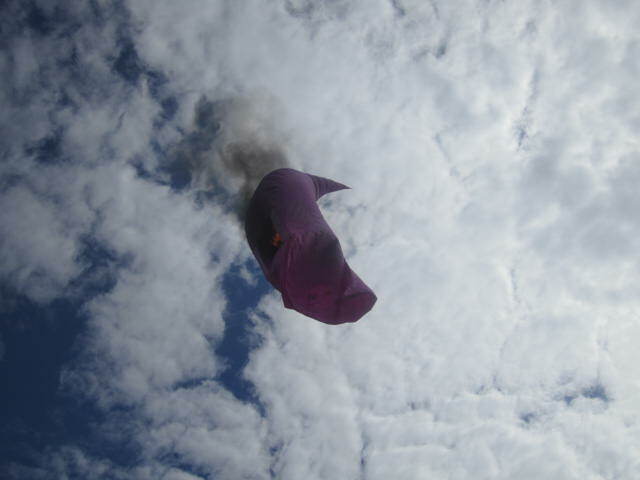 Everyone hopes that the globos will able to make it into the air but there is also excitement when they crash and burn. 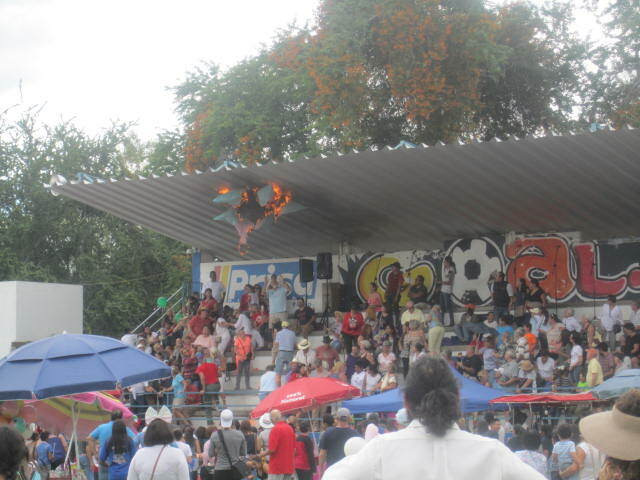 You really have to be alert at this event or you may get some bits of a flaming globo on your head. But that is part of the excitement. No worries though. I have never seen anyone catch on fire. We were down at Ajijic last September and really love the quaintness and friendly folks. Thank you for the wonderful pictures and commentary!